We love the Goldiblox toys! STEM at its best! Every year at Thanksgiving it’s our tradition to watch the Macy’s Thanksgiving Day Parade while we munch on homemade pumpkin bread. This year, while watching the parade one of my daughters noticed a new parade float whose description intrigued her: GoldieBlox. A couple of days after Christmas we suddenly had a zipline in the dining room, in the hallway, in the bedroom and outside in the backyard. book, as well as the doll and the items needed to build the particular project in each kit. 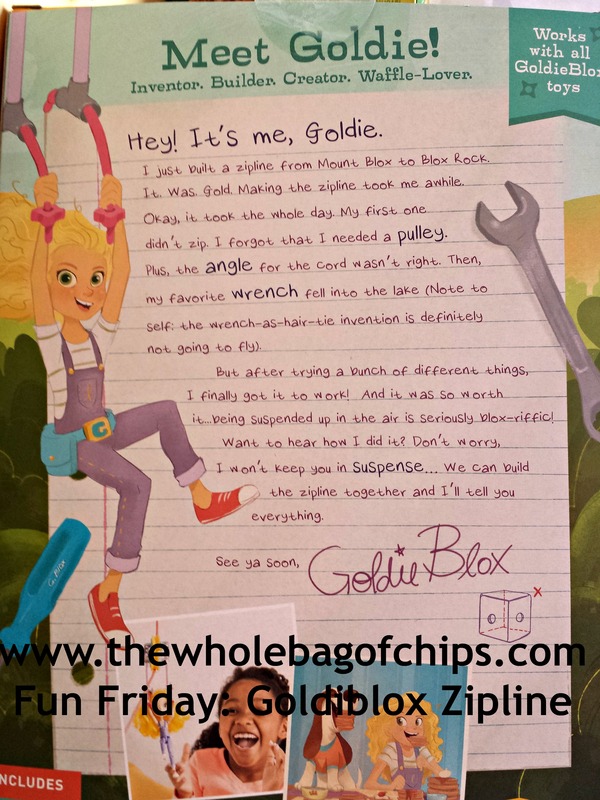 My daughter had two specific GoldieBlox toys on her mind, and she was thrilled when she received the Zipline kit, which included the doll, for Christmas from a family member. The kit came with all of the tools and instructions my daughter needed to create a zipline for GoldieBlox and came with a great deal of information to explain why the zipline had to be put together as it was, and what made it work. It was exciting as the girls got the pieces put together and Goldie took her first ride from the top of our sliding glass door down to the handle of the door next to it. Before we knew it, Goldie was zipping all over the place, even outdoors. Thankfully we have had a relatively warm, snowless winter so far, and playing outside in the days after Christmas was definitely an option. Goldie zipped right off the deck and into the yard in the sunshine and fresh air. Zipping off the top of the deck and right into the backyard! Afterwards, my daughter played with the part of the toy that Goldie holds on to when she’s zipping, to see what else she could create with all the same pieces and materials. At one point Goldie was even on a scooter that my daughter created. I like everything about this toy, all of the STEM parts to it, all of the reading and learning that goes with it, and the fact that it can come with a doll that’s a smart doll who’s into reading, building, math, science and engineering just like my girls always have been. I’m also always very proud when I can show my daughters a local person, especially if it’s a female who has done great things, and this latest opportunity made me especially happy. I also like that GoldieBlox toys are reasonably priced. They range anywhere from about $25 for some of the simpler kits like the Zipline, to more expensive for more complicated kits like the one that replicates the Macy’s Parade float, and everywhere in between. 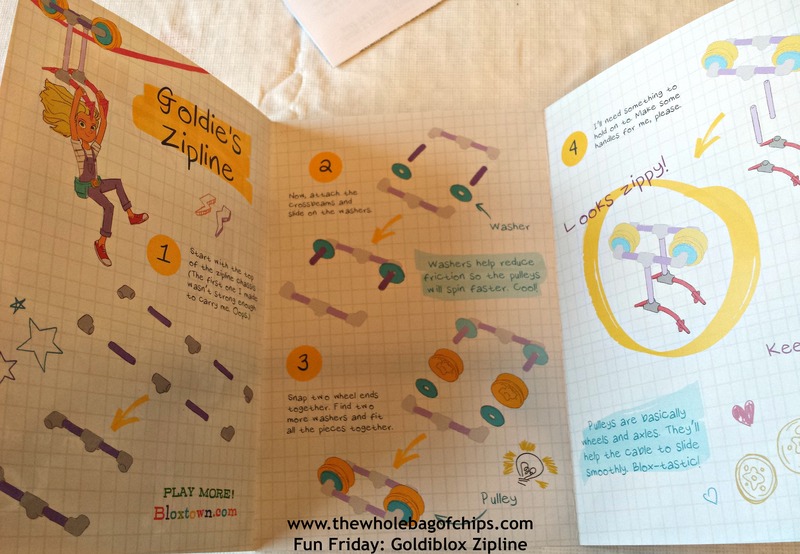 We have one more GoldieBlox toy here that I’ll talk about next week, but if you haven’t heard of GoldieBlox until now, I encourage you to check out their website and learn more about her! You can buy right on their site or find a store locally that sells her near you! There’s even an interactive game spot on the GoldieBlox site! These sound awesome! STEM wasn’t a buzzword when our kids were small, but we went out of our way to make sure we always had lots of building, creating, and logic toys and activities in the house. GoldieBlox surely would have been one of them had she existed back then!